I love how simple this piece is. I took a vintage gold-plated four picture locket and hung it from a new gold-filled chain. 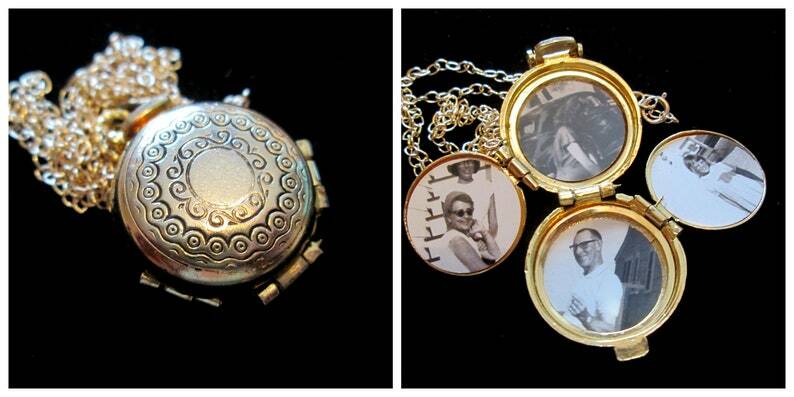 The locket opens to hold 4 photos. The photos inside are held down with tape and can easily be removed and replaced with your treasure. There is a gold-filled spring ring clasp. As these pieces are vintage, they may show slight signs of age. As seen in the third picture, one of the photo slots has to be manually opened, it no longer "springs" open. The chain measures approximately 25 inches but can easily be shortened upon request at check-out. The photo portion of the locket is approximately 3/4 inch in diameter. Love love love this! Such a special piece, made with love! I will definitely be back to purchase more special pieces!